Archbishop Martin W. Currie, D.D. Archbishop Martin William Currie was born in Sheet Harbour, Nova Scotia, on December 11, 1943, the third of nine children of Everett and Mabel (Walsh) Currie. Upon graduation from Sheet Harbour High School in 1961, he studied at St. Francis Xavier University, earning a Bachelor of Arts Degree in 1964. That same year he entered the Seminary, Halifax, and was ordained to the priesthood in Sheet Harbour on May 12, 1968. From 1968-1974, Fr. Currie served as assistant in St. Patrick’s Parish, Halifax and St. Charles Parish, Amherst. From 1975-1980 he served in the Archdiocesan mission parish of San Jose Obrero, Chiclayo, Peru. Fr. Currie served as pastor in several parishes including St. Joseph’s Parish, Bridgewater, St. Norbert’s Parish, Lunenburg and St. Vincent de Paul Parish, Dartmouth. He served as Chaplain at the Halifax County Regional Rehabilitation Centre and was appointed Vicar General of the Archdiocese of Halifax in 1992. Following a brief study period in Israel, Msgr. Currie was appointed Chancellor of the Archdiocese in 1994 working full time. In 1995, while remaining Chancellor and Vicar General, Msgr. Currie was elected Administrator of the Archdiocese, serving in this capacity for a year. In 1999, Msgr. Currie became pastor of Immaculate Conception Parish, Truro while continuing to serve as Vicar General of the Archdiocese, member of the Personnel Board and as Archdiocesan Representative at the Atlantic School of Theology. In addition, he served as Chaplain to the RCMP. Msgr. Currie has been Chaplain of the St. Vincent de Paul Society and Archdiocesan Director of Propagation of the Faith. He has served on the boards of Nova Scotia Drug Dependency, St. Mary’s University and St. Vincent’s Guest House. On December 12, 2000, Msgr. 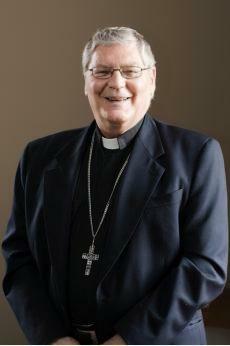 Currie was appointed Bishop of the Diocese of Grand Falls, NL. Upon his Episcopal Ordination on January 31, 2001 he became the 8th bishop of the Diocese. During 2006-2007, he was also named Apostolic Administrator of the Diocese of Saint John, NB. As a member of the CCCB he has served on the National Council of the Canadian Catholic Organization for Development & Peace, founded by the Bishops of Canada 40 years ago. Pope Benedict XVI named Most Rev. Martin William Currie as Archbishop of St. John’s, Newfoundland Labrador on October 17, 2007. He was installed as the Archbishop of St. John’s on Friday, November 30, 2007 at the Basilica-Cathedral of St. John the Baptist.